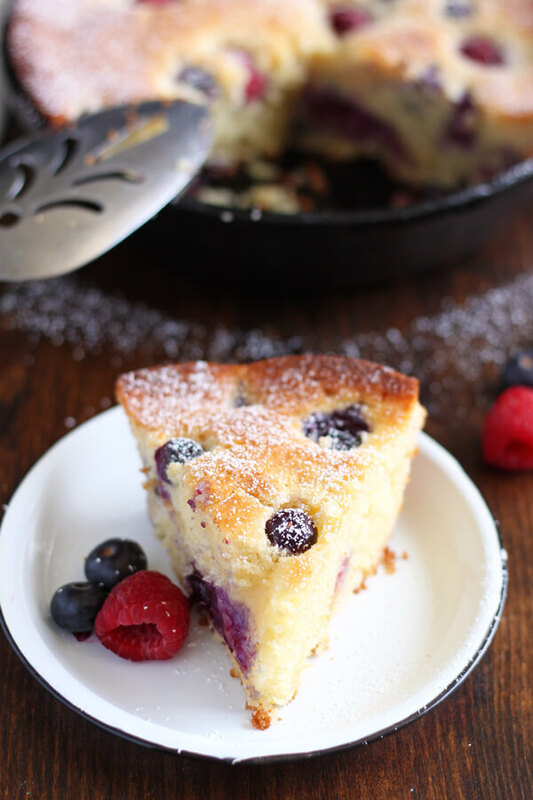 This Mascarpone Mixed Berry Cake is so soft and moist, it can be baked and served straight from the pan. You can serve it as a coffee cake for brunch or with a scoop of ice cream for dessert. I was browsing Instagram on a lazy weekend morning a couple weeks ago and came across this ricotta cake. Look at that pretty golden brown top with berry dimples and snowy powder sugar! I need that cake. And when I need cake, I make cake. 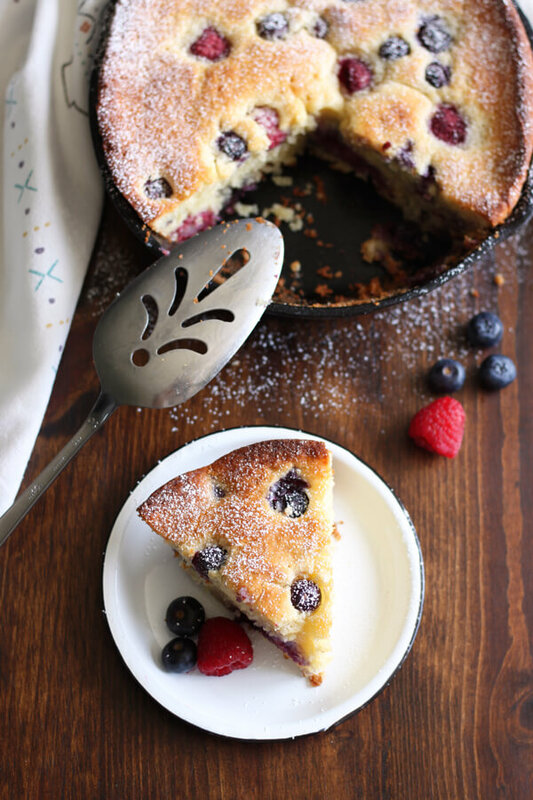 So, say hello to this Mascarpone Mixed Berry Cake. I didn’t have ricotta but I had some left-over mascarpone that I’ve been waiting to incorporate in a recipe. I used blueberry and raspberry in this recipe since that was what I had on hand, but you may use any kind, and as many kind as you please. Mascarpone is a soft cheese, you don’t need to beat it in this recipe, just leave it out on the counter for 10 minutes and it will incorporate nicely with other ingredients. 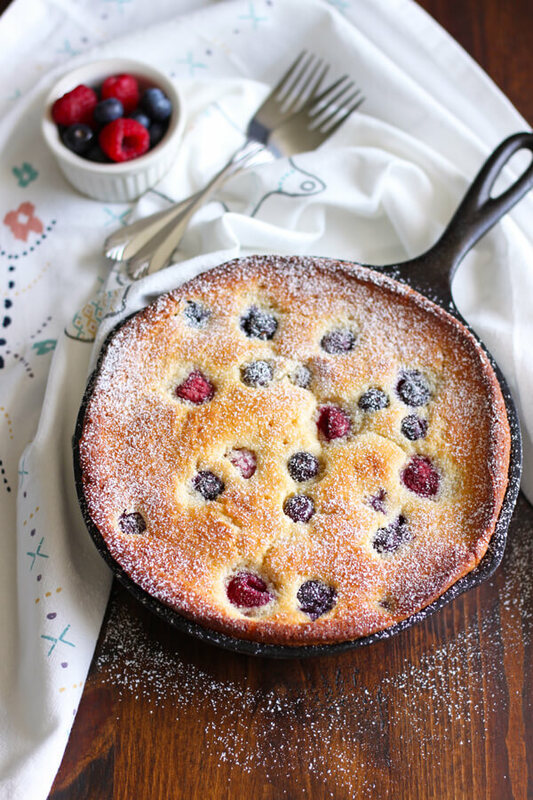 This cake can be baked in an 8″ cast iron skillet, or a same size springform cake pan, as long as the side is about 2.5″ or higher to ensure the batter doesn’t spill over. This cake stores well in the fridge, and stays moist for days. I don’t normally bake cake because cakes are kind of fancy and time consuming in my mind. I feel like I need to be throwing a party for an excuse to bake a cake. But I love cake, and THIS mascarpone mixed berry cake was so easy and un-fancy. All you need is a mixing bowl and a whisk. The cake can be baked and served straight from the pan. You don’t even need to unmold it, or decorate it with anything. The powder sugar is totally optional, but it does add a little something extra aesthetically. 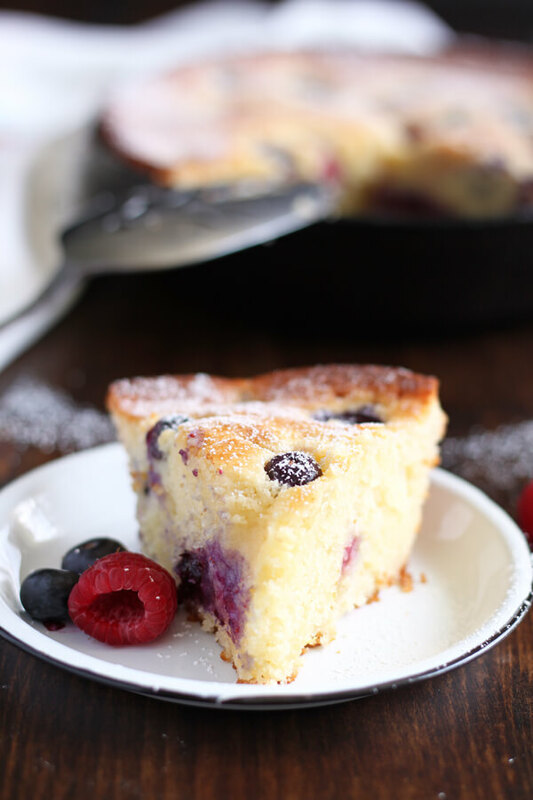 This cake is so soft and moist thanks to the mascarpone cheese and fresh berries. I typically send left-over baked goods to work with Ryan, but this time we kept this cake for ourselves. It keeps well in the fridge. To serve it the next day, just warm up a slice in the microwave for 15-20 seconds. We ate it for breakfast and added a scoop of ice cream on the side for dessert. Seriously, make this cake, you won’t be disappointed, I promise! Leave the mascarpone cheese out on the counter to soften for 10-15 minutes. Also leave the eggs out to come to room temperature. In a small bowl, measure out flour, sugar, salt, and baking powder, mix together thoroughly with a whisk and set aside. Melt the butter in a microwave safe bowl for 20-30 seconds. Brush an 8” or 9” cast iron skillet with some previously melted butter. Let the remaining cool to room temperature. Add mascarpone cheese, egg, the cool butter, orange extract and vanilla extract to a medium mixing bowl and whisk until smooth. Combine the dry ingredients into the wet ingredients with a spatula. Fold in 2/3 of the berries, use light hand so you don’t smash them. 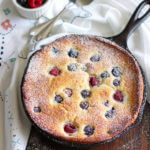 Pour into prepared pan, sprinkle the remaining berries on top. Bake for 45-47 minutes until an inserted toothpick comes out clean. Let cool on a wire rack completely before slicing and dusting with powder sugar. 1. You can bake this cake in a regular cake pan or a spring form pan, the smaller the pan the higher the side needs to be so the cake doesn’t spill over. For reference, I used an 8” skillet with about 2.5” side and the cake rose just a tad above the rim. 2. Store in the refrigerator, this cake stays fresh and moist for days. 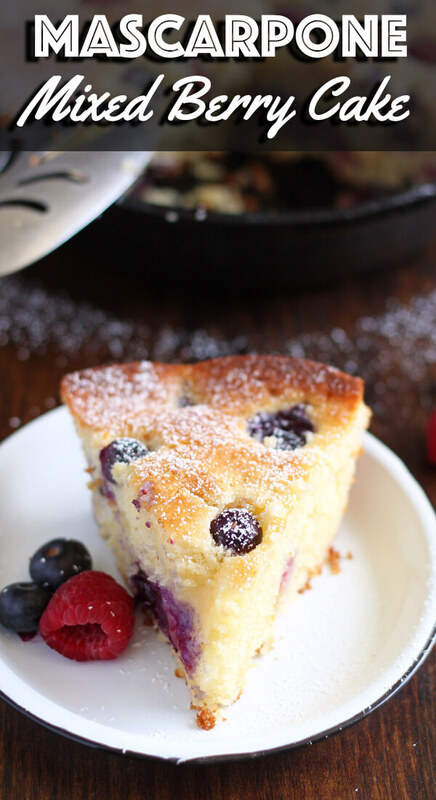 Inspired by and adapted from Easy Ricotta Cake with Fresh Berries. This cake is right up my alley! 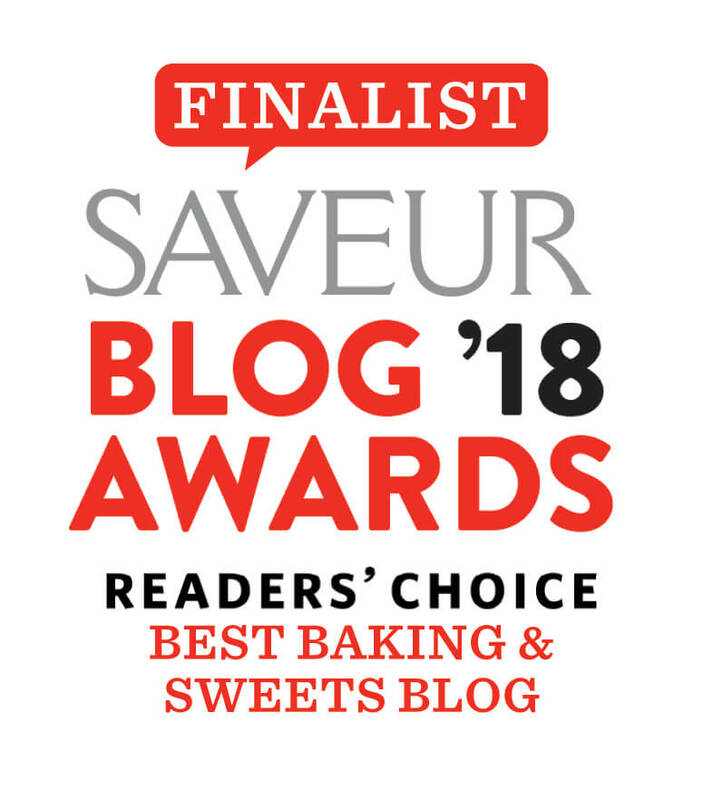 Love that you used mascarpone in it! !